You might not know who Matthew Dunstan is, but soon you will. He designed 2 games I very much enjoy Relic Runners and Elysium, along with several others. He also has several games coming out in 2017, chief among them Professor Evil and the Citadel of Time and Pyramids. But you’re not here to hear me talk about the man. Let’s hear what he has to say. I’m Matthew Dunstan, and I’m an Australian who has been living in the United Kingdom for the past 5 years. I started designing games a bit before my move, when I lived in Sydney, probably around 6 years ago – although it wasn’t until 2013 that I had my first game published (Relic Runners by Days of Wonder). I’m a research scientist in materials chemistry for my day job, so either I’m experimenting in the lab or with games. It’s a tough decision! I think its a tie for me between Hansa Teutonica by Andreas Steding, Race for the Galaxy by Thomas Lehmann and Magic: The Gathering by Richard Garfield. Generally I have two types of games I really like: strategic games with a strong spatial component (such as Hansa Teutonica, or Five Tribes), and games with cards with special powers. Even though I haven’t played Magic regularly for at least a decade now, I still find myself thinking about designing decks – I think there are some similarities to the same impulses that make me design games. Depending on the crowd, there are a number of different games I like to use: Codenames, Sushi Go! and The Resistance being favourites of mine. Codenames especially is relatively easy to get into, and appeals to a really wide range of people (also I’m learning Czech at the moment, and playing with the Czech version helps me learn new vocabulary). But it really does depend on who I’m playing with – I managed to get one friend into games by teaching her Caylus at about 1 am early one morning! The one that stands out is my first and only experience playing Diplomacy in real life. Me and 6 other friends all gathered at someone’s house in the morning, and we proceeded to play throughout the whole day, with lots of good food and backstabbing throughout. It really was the perfect combination of good company and games, and the experience playing the game is incredible, its really unlike anything I have played since. But its not something you could play every day – I remember we were just exhausted from all the plotting by the evening! Unfortunately I left my copy back in Australia, so I haven’t played since. The company. For me, games are the way I can spend time with amazing people, both new and old friends alike. It doesn’t really matter what we’re playing, for me I just enjoy the social aspect. This is something really different to other games – my experience playing competitive Magic for example was vastly different, and much less enjoyable. There is something unique about the tabletop hobby in just how friendly everyone is, from players to publishers. Its a very fun industry to be a part of. I think I just enjoy the puzzle of taking some new idea and trying to see how you can create something new and engaging out of it. The journey games take are always really interesting, how an original idea morphs and is refined over time, and the destination is often somewhere unexpected. Something just really grips me about wanting to see where these ideas will go. I also really enjoy being involved in the creation of something real and physical, even something that other people can hopefully enjoy playing. 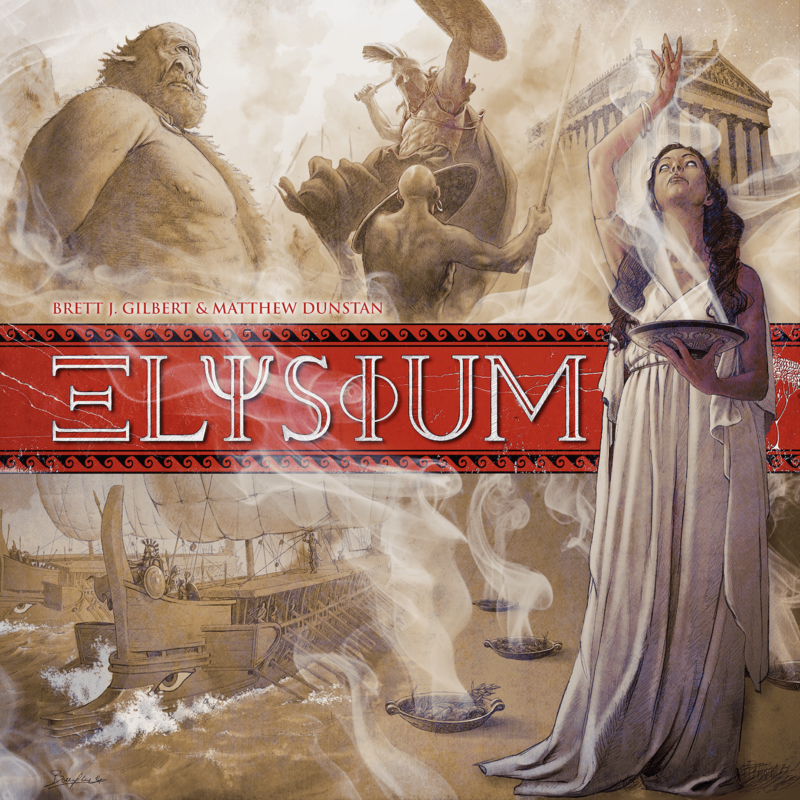 Probably I’m most proud of the game Elysium, which I co-designed with Brett J. Gilbert and was published by Space Cowboys. Its a type of game that I genuinely really love – a game with hundreds of cards, all with different powers and combos – but furthermore I think it is a really clean experience, even with all these powers, and I have to thank Brett for being really good at making sure that the game would still be accessible and enjoyable. What made it even better was the incredible work by Space Cowboys in making such a beautiful product, going so far as to hire 8 separate artists to give all the god families a unique feel! Overall, I feel incredibly lucky to have been able to work with them, and the result is wonderful. For me the most important part of a game is its mechanics, and that they result in something interesting for players to think about. I try to incorporate theme earlier into my design process now, but really what I am looking for is an engaging system that players can interact with. So when designing, the thing that gets me excited to work on a game is a strong mechanical identity which then leads to interesting decisions. That moment when you start to play a prototype and you are truly engaged and interested in the game and all your choices – that’s what I love. For example, I was just playtesting the newest version of a card game Brett and I have been working on, and it was really just a pleasure to play, even in prototype form, because of all of the kinds of decisions you have to make. Earlier in my design career I definitely started with mechanisms first, but more and more I focus on theme, or the type of game experience I want to create first. This is especially important when you are thinking of pitching games to publishers – there are always certain types of games that they are looking for, and often I might start with a restriction such as making a game with 110 cards or less, because I know that’s a style of game that publishers want. So yes, I think I now start with the type of game experience that I want to design. Right now I’m having the design itch to work on another special powers card game, so I’m sketching out a lot of possible ideas for that. Actually, a lot of the time they come from adapting other games or ideas. For example, I was just watching a Dice Tower video earlier this week where Tom mentioned off hand that he would love to play a quicker racing-style game, and something just hit me. I had a new game in about 30 minutes, all sketched out, and it was just from that offhand comment. That’s why I try to watch as many reviews and playthroughs of other games as possible, I never know when a certain part of another game, or what a reviewer will say, will lead to inspiration. Looking forward to that quick racing game inspired by Tom Vasel 😀 I have recently tried Automobiles, but it didn’t grabbed me (though it is rated rather high).